The following bulletin was obtained from a public website for government mailing lists. (U//FOUO) Use of vehicles by violent extremists for ramming attacks has increased steadily, while use of vehicle-borne improvised explosive devices (VBIEDs) remains rare outside the Middle East. Given the ease with which ramming attacks can be accomplished, it is likely use of this tactic will continue to rise. Unlike VBIEDs, ramming attacks require little specialized training or skill, present minimal risk of detection when acquiring the weapon, and offer flexibility with regard to preparation, timing, and target. Foreign terrorist organizations (FTOs) have pointedly encouraged use of vehicle ramming attacks, offering explicit tactical advice on vehicle selection, driving tips to maximize fatalities, and targeting suggestions that include parades, festivals, street fairs, outdoor markets or conventions, political rallies, and other crowded targets of opportunity. (U//FOUO) VBIED trends have moved toward simpler bombs built with grouped, pressurized gas cylinders; materials are readily available and raise little suspicion at purchase, and instructions for building the bombs have been published in English-language extremist magazines. VBIEDs remain attractive weapons because successful deployment generates significant damage, can produce high death tolls, and garners high-profile media coverage. Sophisticated VBIEDs constructed with fuels, fertilizers, and other chemicals are infrequently used, reflecting increased barriers to material acquisition, lack of specialized training and knowledge to construct the weapon, and high risk of detection and interdiction during these phases of the attack. (U//FOUO) Al-Qa’ida in the Arabian Peninsula (AQAP) and ISIS have both published explicit tactical advice/direction for vehicular attacks. 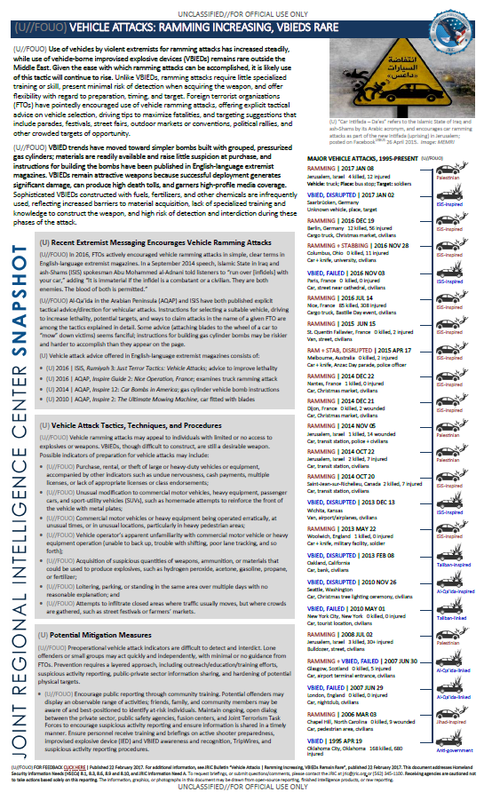 Instructions for selecting a suitable vehicle, driving to increase lethality, potential targets, and ways to claim attacks in the name of a given FTO are among the tactics explained in detail. Some advice (attaching blades to the wheel of a car to “mow” down victims) seems fanciful; instructions for building gas cylinder bombs may be riskier and harder to accomplish than they appear on the page.